Welcome to Arlington Toyota near Yulee, FL! Our dealership has been awarded the Toyota President’s Award over 10 times in recognition of our commitment to providing exceptional service in all areas of the car-buying process. From our friendly, passionate sales team to our flexible, expert finance team and our highly experienced service center, we make it our mission to treat you like family. Our website is dedicated to educating our customers on the various features of our quality, dependable Toyota vehicles. 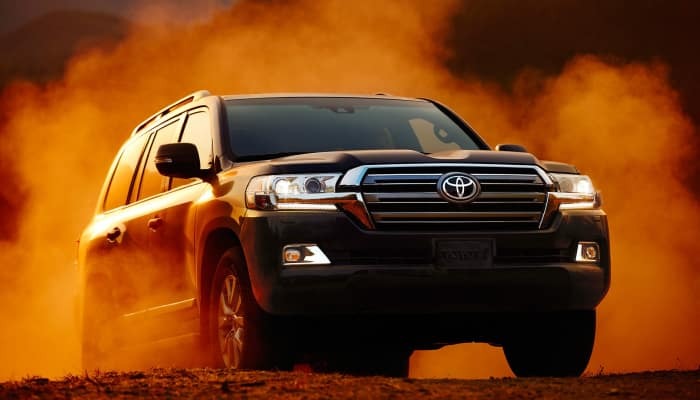 The following is our review of the latest features on the 2019 Toyota Land Cruiser, our top-rated luxury SUV engineered for impressive off-road capabilities. The 2019 Toyota Land Cruiser comes fully loaded, as any luxury vehicle should, and is available to test drive today at our dealership near Yulee, FL. The 2019 Toyota Land Cruiser is designed for exceptional on- and off-road performance. It all starts with the 5.7L V8 engine that puts out 381-hp and 401 lb-ft of torque. The Land Cruiser doesn’t stop at raw power. Toyota has engineered a “smart” engine that maximizes power with its Dual Independent Variable Valve Timing and its Acoustic Control Induction System. 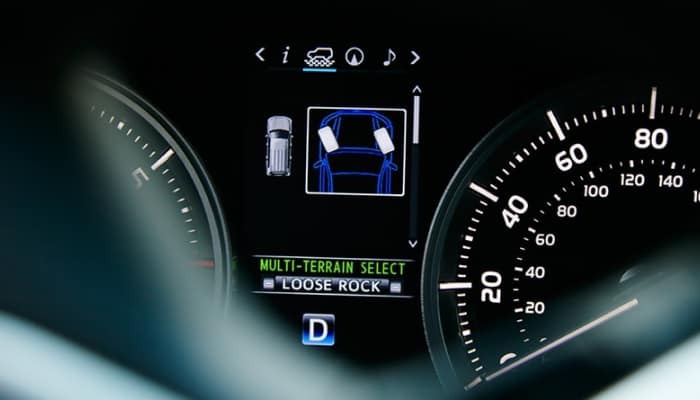 The automatic 8-speed transmission is also “smart.” With electronic, intelligent control, the Land Cruiser calculates the best gear depending on throttle input, speed, and incline. Want to take control yourself? The 2019 Toyota Land Cruiser features sequential shift mode so you can override with manual gear input. True to its off-roading nature, the Land Cruiser continues to boast an expertly engineered suspension system that supplies the individual needs of the front and rear suspension. The double-wishbone front suspension works in tandem with the rear 4-link suspension to provide the ultimate ride experience over any terrain. The Kinetic Dynamic Suspension System adds yet another “smart” element to the Land Cruiser, allowing the vehicle to automatically adapt to uneven terrain by adjusting and disabling various suspension features. The 2019 Toyota Land Cruiser offers additional performance features that you just won’t find anywhere else, such as the Crawl Control that initiates automatic control over low-speeds and off-road Turn Assist to improve and sharpen even the tightest turns. 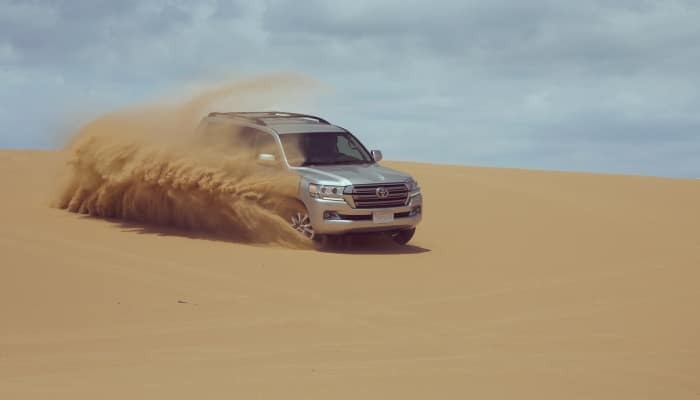 Given these impressive performance specs, it’s no wonder third party reviews make note of the Land Cruiser‘s exceptional power, braking, and surprising acceleration. The exterior of the 2019 Land Cruiser is designed to convey its powerful performance and luxury interior. Its tall and square shape give a rugged appearance to match its true off-road nature. With chrome accents, stylish LED lighting design, and aggressive hood molding, the Land Cruiser frames its polished and sleek exterior at every opportunity. The elegant exterior color options include Blizzard Pearl, Brandywine Mica, Blue Onyx Pearl, Midnight Black, and two gray metallic finishes. 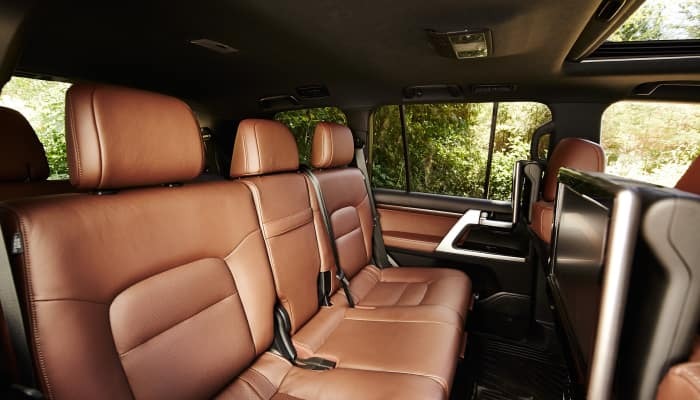 You’ll find the truest luxury in the 2019 Toyota Land Cruiser interior, with its soft surfaces, heated and ventilated seats, and available two-tone trims. Reviews of this latest model year consistently touch on the comfortable spaciousness and quiet ride. This large SUV seats eight with various row folding configurations and a reclining second row. It boasts 81.7 cubic feet of cargo space when both rear rows are folded. In the Land Cruiser, you can ride in comfort with plush, leather seats and thoughtful perks, like a built-in cooler to keep your drinks and snacks cold. In addition to the incredibly smart engineering of the 2019 Toyota Land Cruiser‘s performance, you’ll have access to the latest technology in the cabin. Your user-friendly technology begins with the standard 9” touchscreen console that provides access to the Entune App suite. Beyond its standard navigation and streaming radio, this touchscreen allows you to discover nearby restaurants, find the nearest gas station or hospital, purchase movie tickets, and more. You can also connect your smartphone with Apple CarPlay. The 14-speaker JBL system provides the finest in surround sound. The 9” touchscreen can also serve as a multi-terrain monitor, which displays live-feed camera images from every side of the Land Cruiser as well as data on the tilt of the vehicle over uneven terrain. 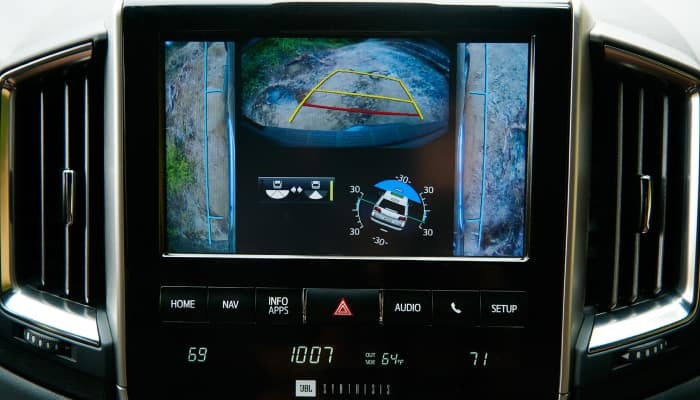 The 2019 Land Cruiser comes standard with the Toyota Safety Sense suite. You’ll drive with assurance knowing you have a pre-collision system with forward collision and pedestrian detection. The Brake Assist can kick in to help you slow in time to prevent an accident. Blind spot monitoring and cross traffic monitoring can alert you to vehicles or objects to your sides and rear while changing lanes or reversing. Lane departure alert and sway warning can help you keep on the straight and narrow, while automatic high beams adjust brightness to give you optimal visibility without blinding other drivers on the road. Toyota’s radar cruise control helps your Land Cruiser maintain a safe distance from other vehicles by slowing and accelerating automatically. In the event of a collision, the active headrests on the front seats help protect your neck and head. Should you ever need it, Toyota offers 24/7 roadside assistance with collision notification as well as assistance locating your Land Cruiser should it ever be stolen. Why Buy from Arlington Toyota near Yulee, FL? At Arlington Toyota, we believe in providing VIP customer service from beginning to end. We combine the best available manufacturer and Arlington-exclusive specials to make your base vehicle price as low as possible. We also offer the most flexible financing near Yulee, FL thanks to our close relationships with a wide variety of lenders. This allows you to shop for the best interest rates and loan terms for your unique financial situation. You can keep your 2019 Toyota Land Cruiser running at peak performance with the help of our ultramodern auto service center. With over 175 years of combined experience, our auto technicians are manufacturer-trained to specialize in Toyota vehicles. We use genuine, long-lasting Toyota parts and factory-recommended techniques to save you more money on maintenance in the long run. Arlington Toyota near Yulee, FL has been a top-rated dealership for decades. We invite you to come visit our friendly, helpful Arlington team and see for yourself why our customers love us! We appreciate your interest in our inventory, and apologize we do not have model details displaying on the website at this time. Please fill the form out below and our team will quickly respond, or, please call us at (904) 201-4060 for more information.